Deep neural networks prove to be a right direction after all, but the enormous computational complexity calls for new research into novel ways of making efficient implementations of the connectionist model for small, mobile devices. In this talk I will discuss two directions, one based on FPGA and the other based on a new computing paradigm called stochastic computing (SC). FPGA is a very capable device housing thousands of processing elements in a single chip with low power consumption. However, FPGAs are very different from GPUs, and making it easy to program FPGAs for deep neural networks is one of the key challenges facing FPGAs today. I will present a design space exploration approach to help find the best design for a given FPGA and for a specific deep neural network model. Stochastic computing (SC) was first introduced in the 60’s when computing devices were not very reliable. Unlike conventional binary number representations, stochastic computing uses a bitstream to represent a number, and is therefore inherently more error-resilient. In addition, SC shares some good qualities with analog computing such as low power dissipation and low cost while strictly operating in the digital domain. At the same time, error fluctuation and conversion overhead are the key challenges facing SC today. I will present a new SC architecture for deep neural networks that is much more accurate and efficient than previous SC solutions. Jongeun Lee received his B.S. and M.S. in Electrical Engineering, and his Ph.D. in electrical engineering and computer science all from Seoul National University, Korea. In 2009 he joined UNIST (Ulsan National Institute of Science and Technology), Ulsan, Korea, where he is now an Associate Professor of Electrical and Computer Engineering. Prior to joining UNIST, he worked as a postdoctoral research associate at Arizona State University, and previously worked for Samsung Electronics. His current research interests include reconfigurable architectures, compilers, stochastic computing, and deep neural networks. Promising opportunities for research on heterogeneous Internet-of- Things (IoT) devices lie at the energy-bottom floor, where CMOS is still an unbeatable, flexible technology to make the internet of “everything” possible and cost-effective. Near-threshold computing (NTC) in CMOS is a promising alternative for any application which can tolerate or benefit from very wide voltage-frequency scaling (VFS). The digital blocks of devices may operate at very different power-performance modes, from sub-MHz to peaks of hundreds of MHz, which requires CMOS design libraries targeted for NTC. The analog and RF content on IoT chips will be even more crucial, from a power-savings standpoint. In IoT it is best to avoid using costlier CMOS, and yet closer to an end, two-dimensional transistor and IC scaling. The nano-power range which is achievable in deca-nanometer CMOS at near-VT requires very specific logic design techniques to be applied in digital CMOS. This talk addresses a method to design CMOS digital circuits for a wide dynamic range of VFS, and targets near-threshold for best energy-efficiency. Our work on 65nm CMOS has demonstrated 63X to 77X energy/operation savings for applications that tolerate ultra-wide frequency scaling (from hundreds of KHz to 1GHz) in their system operating modes. The results in CMOS were obtained using the minimal cycle time achievable at each supply voltage, down to very low 200 mV supplies. The strategy for transistor sizing in digital cells and static noise margin maximization will be addressed in particular. 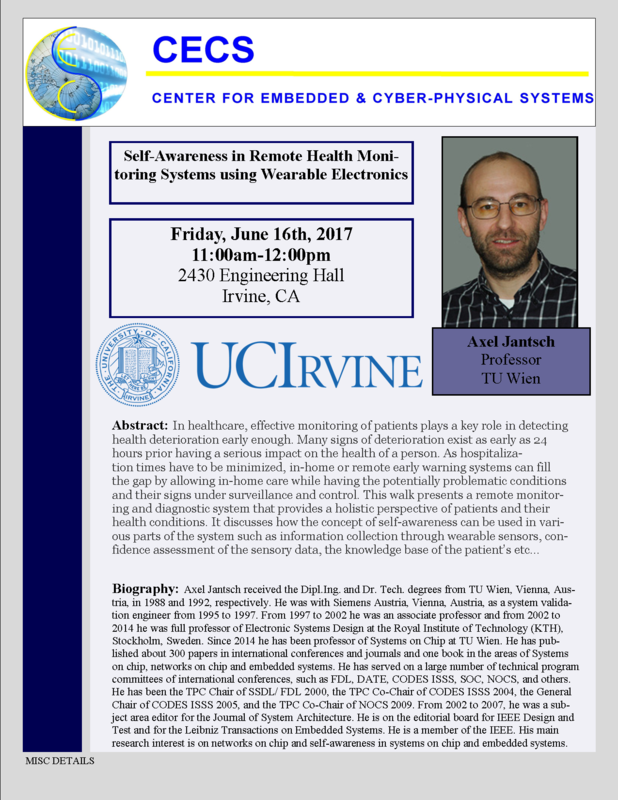 The seminar seeks to stimulate system-level and circuit-level design approaches for IoT nodes, as the presenter is available to discuss digital, mixed-signal, and even RF aspects of CMOS systems-on- IoT-devices. Sergio Bampi received the B.Sc in Electronics Engineering and the B.Sc. in Physics from the Federal Univ. of Rio Grande do Sul (UFRGS, 1979), and the M.Sc. and Ph.D. degrees in EE from Stanford University (USA) in 1986. Full professor in the Digital Systems and Microelectronics design fields at the Informatics Institute, member of the faculty since 1986. He is a member of the PPGC Computing Graduate Program since 1988, and of the PGMICRO since its start in 2002. He served as Graduate Program Coordinator (2003-2007), head of research group and projects, technical director of the Microelectronics Center CEITEC (2005-2008) and is the past President of the FAPERGS Research Funding Foundation and of the SBMICRO Society (2002-2006). He is a former member of HP Inc. technical staff, and a visiting research faculty at Stanford University (1998-99). His research interests are in the area of IC design, nano-CMOS devices, mixed signal and RF CMOS design, ultra-low power digital design, dedicated complex algorithms, architectures, and ASICs for image and video processing. He has co-authored more than 360 papers in these fields and in MOS devices and EDA. He is a senior member of IEEE. He was Technical Program Chair of IEEE SBCCI Symposium (1997, 2005), SBMICRO (1989, 1995), IEEE LASCAS (2013), VARI 2016 Conferences and Workshops. In healthcare, effective monitoring of patients plays a key role in detecting health deterioration early enough. Many signs of deterioration exist as early as 24 hours prior having a serious impact on the health of a person. As hospitalization times have to be minimized, in-home or remote early warning systems can fill the gap by allowing in-home care while having the potentially problematic conditions and their signs under surveillance and control. Early warning score (EWS) is an approach to detect the deterioration of a patient. It is based on a fact that there are several changes in the physiological parameters prior a clinical deterioration of a patient. Currently, EWS procedure is mostly used for in-hospital clinical cases and is performed in a manual paper-based fashion. However, it is possible to build an automated EWS health monitoring system to intelligently monitor vital signs and prevent health deterioration for in-home and hospitalized patients using Internet-of-Things technologies. Pasi Liljeberg received the MSc and PhD degrees in electronics and information technology from the University of Turku, Turku, Finland, in 1999 and 2005, respectively. He received Adjunct professorship in embedded computing architectures in 2010. Currently he is working as full professor in University of Turku in the field of Embedded Systems and Internet of Things. At the moment his research is focused on biomedical engineering and health technology. In that context he has established and leading the Internet-of-Things for Healthcare, IoT4Health, ( http://iot4health.utu.fi  ) research group. Liljeberg is the author of more than 270 peer-reviewed publications. Accounting for all operating conditions of a system at the design stage is typically infeasible for complex systems. In-situ runtime monitoring and verification can enable a system to introspectively ensure the system is operating correctly in the presence of dynamic environment, to rapidly detect failures, and to provide detailed execution traces to find the root cause thereof. Two key challenges faced in using in-situ runtime verification for embedded systems include 1) efficiently defining and automatically constructing a requirements model for embedded system software and 2) minimizing the runtime overhead of observing and verifying the runtime execution adheres to the requirements model. In this talk, we present a methodology to construct a hierarchical runtime monitoring graph from system requirements specified us- ing multiple UML sequence diagrams, which are already commonly used in software development. We further present the design of on-chip hardware that nonintrusively monitors the system at runtime to ensure the execution matches the requirements model. We evaluate the proposed methodology using a case study of a fail-safe autonomous vehicle subsystem and analyze the relationship between event coverage, detection rate, and hardware requirements. Minjun Seo is a Ph.D. Candidate in the Department of Electrical and Computer Engineering at the University of Arizona. His current research focuses on efficient specification and implementation of in-situ requirements monitoring of embedded systems. His research interests also include design tools and optimization methods supporting efficient verification hardware, FPGAs, and HW/SW co-design. Mr. Seo received a B.S. in Computer Science and Engineering in 2006 and a M.S. in Computer Science in 2008 from Kyungnam University. NAND flash memory is the primary choice of data storage for mobile devices due to its high performance, shock resistance and low power consumption. However, compared to high-end solid-state drives, mobile flash storage does not have the luxury of sophisticated hardware and firmware features because of the resource-constraint limits. Instead, mobile flash storage often equipped with scarce built-in RAM, slow embedded processors and low-cost flash memories, all of which make it a challenge to apply traditional techniques for I/O performance improvements. This talk presents a couple of work that we have done recently to optimize I/O for Mobile Flash Storage. First, this talk will introduce a novel I/O scheduling approach to improve demand-based page-level mapping cache performance. This technique generates mapping cache friendly I/O workloads by strengthening I/O locality at host I/O scheduler. Both temporal locality and spatial localities are taken into consideration for I/O scheduling. Second, this talk will present a lightweight data compression technique at the flash controller to reduce write pressure on mobile flash storage. It first characterizes data compressibility based on real smartphones, and the analysis shows that write traffics bound to mobile storage volumes are highly compressible. This technique is the first to investigate firmware-based data compression for mobile flash storage without adding extra data compression hardware. Experimental results demonstrate the proposed techniques outperform state-of-the-art schemes in terms of I/O latency and flash memory lifespan. Dr. Chun Jason Xue is an Associate Professor at City University of Hong Kong Computer Science Department. His research interests include non-volatile memories, embedded and real time systems. He is currently Associate Editor for ACM Transaction on Embedded Computing Systems, Associate Editor for ACM Transaction on CPS, Associated Editor for ACM Transaction on Storage. He was the TPC co-chair for LCTES 2015, TPC co-char for ISVLSI 2016, and has served as TPC members in premiere conferences such as DAC, DATE, RTSS, RTAS, CODES, EMSOFT and ISLPED. A cyber-physical system (CPS) is a system built from close integration of computational fabrics and physical components. Examples of such systems include avionic systems, industrial control and civil infrastructure monitoring. In a CPS, sensors and actuators are used to monitor and control the physical components while the computational fabrics determine the control values for the actuators based on the sensed data. All CPSs require timely delivery of sensed data from sensors to the computing fabrics and control signals from the computing fabrics to actuators. Managing the limited resources (e.g., computation power and communication bandwidth) to meet the timing requirements in a CPS is a challenging task. Even more challenging is that CPSs should degrade gracefully in the presence of various external disturbances such as failure in critical civil infrastructures and malicious attacks. order to achieve scalability. Experimental implementation on a wireless test bed further validates the applicability of our proposed research. I will end the talk outlining our on-going effort in this exciting and growing area of research. on Nanoscale Architectures in 2009. She is the General Chair of Design Automation Conference in 2018. She is an Associate Editor for ACM Transactions on Cyber- Physical Systems, and also served as Associate Editor for IEEE Transactions on VLSI, etc. Sharon Hu is a Fellow of the IEEE. Her research interests include analysis and design of low power, real-time, and embedded systems, computing with emerging technologies, and computational medicine. She has published more than 200 referred papers in these areas and received numerous research grants from both the U.S. government agencies and private industry. She received the CAREER award from U.S. National Science Foundation in 1997. She received the Best Paper Award from the ACM/IEEE Design Automation Conference in 2001 and from the IEEE Symposium on Nanoscale Architectures in 2009. Another paper of hers was named one of “The Most Influential Papers of 10 Years Design, Automation, and Test in Europe Conference (DATE)”. Sharon is currently Associate Editor for ACM Transactions on Embedded Computing and Co-Chair of the Technical Program Committee of 2014 Design Automation Conference (DAC). She also served as Associate Editor for IEEE Transactions on VLSI and ACM Transactions on Design Automation of Electronic Systems. She has served as guest editors for several different journals/magazines such as the IEEE Computer Magazine and IEEE Transactions on Industrial Informatics. She was the Technical Program Co-Chair of the 9th International Symposium on Hardware/Software Codesign (CODES’2001) and the General Co-Chair of the same conference in 2002. She also served or is serving on the program committee of a number of conferences such as Design Automation Conference (DAC), International Conference on Computer-Aided Design (ICCAD), Design, Automation and Test in Europe Conference )DATE), IEEE Real-Time Systems Symposium (RTSS), and IEEE Real-Time and Embedded Technology and Applications Symposium (RTAS), etc. At the University of Notre Dame, Sharon had been the Director of Graduate Studies for 10 years in the department of Computer Science and Engineering, and was Senior Assistant Provost for ND International between 2012–2013. Currently, she is the Associate Dean for Professional Development at the Graduate School. Shopping is widely considered as a relaxing leisure activity. However, grocery shopping can be a frustrating experience for those with visual impairment. While getting to a grocery shop itself is not as much of a challenge for them, locating and picking the items in the grocery shelf becomes a task as challenging as picking a needle from the haystack. Imagine picking up five items for your dinner recipe from a typical grocery store in the US that carries around 35,000 unique items and can have more than 30 aisles spanning 45,000 square meters. This talk will showcase synergistic advances in algorithms, architectures and interface design for assisting those with visual impairment to do shopping. We will specifically focus on new non-boolean hardware approaches to significantly impact the energy-efficiency of the overall system. Vijay Narayanan is a Distinguished Professor of Computer Science and Engineering and Electrical Engineering at The Pennsylvania State University. He is the director of the NSF Expeditions-in-Computing Program on Visual Cortex on Silicon and a thrust leader for the DARPA-MARCO LEAST Center. He has published more than 400 papers and won several awards in recognition of his research in power-aware systems, embedded systems and computer architecture. He is a fellow of IEEE and ACM. Traditional verification methods and metrics attempt to answer the question: does my design correctly perform the intended functionality? This talk will look at hardware verification from a security perspective, which demands the verification effort answer an additional question: does my design perform malicious functionality in addition to the intended functionality? The talk will motivate through examples why Hardware Trojans modifying only unspecified design functionality are both powerful and stealthy. RTL don’t cares and idle cycles in on-chip bus protocols are two examples of unspecified functionality vulnerable to malicious modification that this talk will explore in depth. This talk will also detail how to formulate the Trojan detection problem as a satisfiability problem in order to leverage existing formal verification tools to highlight Trojans hidden in unspecified functionality. Nicole Fern received her undergraduate degree in Electrical Engineering from The Cooper Union for the Advancement of Science and Art and her PhD degree in the ECE department at UC Santa Barbara under the advisement of Professor Tim Cheng. She is now a post-doc at UC Santa Barbara. Her thesis work focused on developing techniques to verify the absence of Hardware Trojans in unspecified design functionality. Her current research interests include investigating security issues in emerging memory technologies and at the hardware/software boundary. constraints on the mapping of the tasks as well as their communication to cores, respectively routes in the underlying NoC. a source node issues a request to find appropriate resources to embed its sucessor tasks, and so on. pre-analysed constellations for finding a concrete mapping that will satisfy the given non-functional constraints by construction. deadlines or throughput requirements will be automatically met for streaming applications. Finally, we conclude with a discussion on resource constellations that may satisfy certain security requirements on an MPSoC. on the topic of `Synthesis and Optimization of Digital Hardware/Software Systems’ in 1996. Department, University of Paderborn, Germany. with emphasis on hardware/software co-design, reconfigurable computing and multi-core systems. including CODES+ISSS´07, FPL´08, ASAP´10, and DATE´2016. ASAP, FPT, FPGA, RECONFIG, ESTIMEDIA, VLSI Design, GECCO, EMO, RTSS, etc. edited two text books on Hardware/Software Co-Design and recently a Handbook on this topic (Springer). Prof. Teich is involved in many interdisciplinary projects on basic research as well as industrial projects. coordinator of the DFG priority programme 1148 on “Reconfigurable Computing”. Research Center 89 “Invasive Computing” funded by the German Research Foundation (DFG). In 2011, he was elected member of the Academia Europaea. Low-end processor cores can be utilized in various SoC applications including IoT, wireless communication, and machine learning. In this short talk, we will introduce how we designed some low-end integer cores applied to some applications such as deeply embedded IoT and WLAN MAC Soc, and also introduce the basic design of embedded cores for neural networks. Part II: The application-specific design for signal processing applications tends to necessitate multi-disciplinary knowledge on system, algorithm, architecture and circuit levels. In this talk, we will introduce our application-specific design approaches for various signal processing applications. In addition, we discuss several design challenges involved in system-on-a-chip (SoC) design for neural networks, regarding how to customize the on-chip bus architecture. Prof. Fitzgerald Sungkyung Park took his Ph.D. degree in electronics engineering from Seoul National University, Korea, in 2002. He worked for Samsung Electronics from 2002 to 2004, joined Electronics and Telecommunications Research Institute (ETRI) from 2004 to 2006, and worked for Ericsson, Inc., USA, from 2006 to 2009, where he developed mixed-signal circuits for radio transceivers. In 2009, he joined the faculty of Pusan National University, where he has worked on low-end processors and SoC for IoT and other applications. Prof. Chester Park received his Ph.D. degree in electrical engineering from the Korea Advanced Institute of Science and Technology (KAIST), Korea, in 2006. After about two years with Samsung Electronics Inc., Giheung, Korea, he joined Ericsson Research, USA, where he developed various signal processing algorithms for wireless communications. Since 2013, he has been with Konkuk University, Seoul, Korea, working on hardware accelerator design for signal processing algorithms. Abstract: Multicore technology plays a pivotal role in conquering key societal challenges. For example, safe, ecological mobility, wide-spread rollout of eHealth, smart industrial automation and the development of a secure, high-bandwidth, low-latency mobile communication infrastructure for Industry 4.0, all these application domains are critically dependent on high-performance, low power and dependable computing. However, multicore technology also comes with a number of unique challenges for industry and academia. Today, the efficient utilization of massively parallel computing resources largely depends on the experience of individual programmers. Application-specific accelerators and generic enablement building blocks for Multicore System on Chip (MCSoC) platforms are research foci at the Chair for Integrated Systems at TU München. These building blocks support a more performant, energy efficient, easier to use and more resilient deployment of multicore processors by application programmers and system integrators. In my talk, I will present current and past research projects on wire-speed traffic distribution among Software Defined Networking (SDN) nodes, interconnect virtualization for Network on Chip and processing node resilience, efficient multicore deployment in legacy automotive CAN networks and on-chip diagnosis for effective software debugging. Biography: Andreas Herkersdorf is a professor at the Department of Electrical and Computer Engineering and also adjunct to the Department of Informatics at Technische Universität München (TUM). He received the diploma degree from TUM in 1987 and the Dr. degree from ETH Zurich, Switzerland, in 1991, both in electrical engineering. Between 1988 and 2003, he has been a research staff member and manager at the IBM Zurich Research Laboratory in Rüschlikon, Switzerland. Since 2003, Dr. Herkersdorf is head of the Chair for Integrated Systems at TUM. He is a senior member of the IEEE, member of the DFG (German Research Foundation) Review Board and serves as editor for Springer, Elsevier and deGruyter journals for design automation, communications electronics and information technology. His research interests include application-specific multi-processor architectures, IP network processing, Network on Chip, system level SoC modeling and design space exploration methods, and self-aware fault-tolerant computing. Modern Systems-on-Chip (SoC) architectures and state-of-the-art computing platforms that integrate CPUs with FPGAs are heterogeneous systems featuring an increasing number of hardware accelerators. Private local memories play a key role in the design of these components both with respect to performance optimization and because they are responsible for most of their area and power dissipation. Each local memory unit is usually implemented with a multibank microarchitecture based on the combined requirements of each hardware block accessing the corresponding data. However, the creation of these multibank memory microarchitectures is not well supported by current design flows, and the designers must perform this tedious and error-prone process manually. In this talk, I will present a system-level methodology for the generation of multi-bank memories in heterogeneous architectures. The methodology is supported by Mnemosyne, an open-source prototype CAD tool that can be easily integrated into commercial design flows. Mnemosyneincludes various technology-aware optimizations to reduce the memory cost (area and power) by efficiently reusing the physical banks for storing different data. With Mnemosyne,we can reduce the memory cost of single accelerators by up to 45%. Moreover, when reusing memory IPs across accelerators, we achieve area savings that range between 17% and 55% compared to the case where the memory elements are designed separately. Christian Pilato is a Postdoctoral Researcher at the ALaRi institute of Università della Svizzera italiana (USI), Lugano, Switzerland. He received the Laurea degree in computer engineering and the Ph.D. degree in information technology from Politecnico di Milano, Italy, in 2007 and 2011, respectively. From 2013 to 2016, he was a Postdoctoral Research Scientist with the Department of Computer Science, Columbia University, USA. He has been visiting researcher at NanGate, Chalmers University of Technology, and Delft University of Technology. His current research interests include high-level synthesis, reconfigurable systems and system-on-chip architectures, with emphasis on memory aspects. He has actively participated in several projects sponsored by the European Union and DARPA, as well as a research center supported by SRC. Dr. Pilato served as the Program Chair of the Embedded and Ubiquitous Conference (EUC) in 2014. He is currently involved in the program committees of many conferences on embedded systems, CAD, and reconfigurable architectures, such as FPL, DATE, and CASES. He is a Member of IEEE and ACM. The computing systems have been evolving at a fast pace and they are increasingly ubiquitous. This trend is driven by advancements in mobile technologies and emerging of Internet-of-Things (IoT) as well as new applications. However, the complexity and diversity of these systems continue to rise, which require transformative design automation solutions to meet stringent design metrics, e.g. time-to-market. This talk will address research problems in mobile computing at the system level with some emphasis on energy efficiency and power budgeting of the CPU-GPU subsystem as well as user-experience related problems (e.g. skin temperature estimation and control). In addition, this talk will discuss emerging challenges and future research problems in the domain of IoT systems with a focus on End-to-End system design. Raid Ayoub received his Ph.D. degree in computer engineering from the department of computer science and engineering, University of California at San Diego in 2011.Currently he is a research scientist at the Strategic CAD Labs of Intel Corporation. He has published more than 30 journal and conference papers. His research interests include run-time optimizations, dynamic control, system modeling, human cyber-physical systems/IoT, dynamic power and thermal management, machine learning, and design automation. Date and Time: Friday, June 16, 2017 at 11 A.M.
(iii) the attention property of self-awareness to improve the energy efficiency and dependability of the system via adjusting the priorities of the sensory data collection. Axel Jantsch received the Dipl.Ing. and Dr. Tech. degrees from TU Wien, Vienna, Austria, in 1988 and 1992, respectively. He was with Siemens Austria, Vienna, Austria, as a system validation engineer from 1995 to 1997. From 1997 to 2002 he was an associate professor and from 2002 to 2014 he was full professor of Electronic Systems Design at the Royal Institute of Technology (KTH), Stockholm, Sweden. Since 2014 he has been professor of Systems on Chip at TU Wien. He has published about 300 papers in international conferences and journals and one book in the areas of Systems on chip, networks on chip and embedded systems. He has served on a large number of technical program committees of international conferences, such as FDL, DATE, CODES ISSS, SOC, NOCS, and others. He has been the TPC Chair of SSDL/ FDL 2000, the TPC Co-Chair of CODES ISSS 2004, the General Chair of CODES ISSS 2005, and the TPC Co-Chair of NOCS 2009. From 2002 to 2007, he was a subject area editor for the Journal of System Architecture. He is on the editorial board for IEEE Design and Test and for the Leibniz Transactions on Embedded Systems. He is a member of the IEEE. His main research interest is on networks on chip and self-awareness in systems on chip and embedded systems.